You have to give Beaufort County South Carolina credit for being a true jewel along the Low Country coast. There is always something to see and learn in this city that is a mixture of Old Southern pleasures and modern day delights. I have tagged along on walking tours around the Town of Beaufort and have driven along many of the most popular scenic routes myself. To my way of thinking nothing can top the horse and buggy rides that are available. Southurn Rose Buggy Tours offer a lot of tour for a reasonable price. The drivers give a 50 minute ride and the Tour Guides are historically certified. They happily tell you the history, point out unusual features or sites, and do a good job of keeping the event lively and educational with this historical City of Beaufort SC tour. If you ask your driver politely you can even get them to divulge a little back door gossip.They will tell you little known facts about ghosts, old plantation families and notorious long-ago residents of Beaufort County South Carolina. 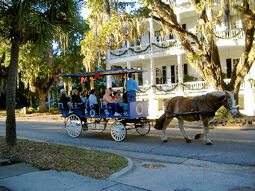 Their tour route takes you through the Point neighborhood and the downtown historic district in the Town of Beaufort. Be sure to take along a camera because you will be driven to some wonderful homes that have been used for movie locations. I only had my phone with me, so the few shots that I got were not that great. This buggy ride costs $18 for adults and $7 for kids from 5-12 under 5 is free. 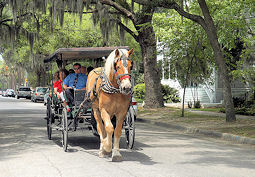 The carriages are comfortable and the rhythmic clopping of the horses hooves against the bricks and pavement create a perfect backdrop for this City of Beaufort SC activity. I have to say that these carriage rides will make you forget about cars and taxis, at least for a little while. There is something incredibly relaxing about just leisurely traveling along that seems to whisk you back in time. One thing to keep in mind is that there are always special events that involve these horse drawn carriages. At Halloween there are ghost tours in the Town of Beaufort, and this is the one that I am most looking forward to this year. What better way to visit the haunted sites of the town than with a horse and buggy? I have heard that before the tours begin you get matches to light in case the spirits get too frisky. As many Beaufort County South Carolina residents are aware, ghosts are kept at bay because of the sulfuric smell created by a burning match. No one has yet told me what you do if you run out of matches though, so I may keep a couple of packs in my pocket just in case.